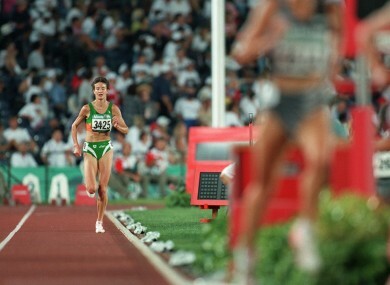 Sonia O'Sullivan struggles at the 1996 Olympics. SILLY US. LAST week, drunk on hope, we brought you seven Irish victories over England. Ireland subsequently lost 30-9 to England. Here’s a few Irish sporting anti-climaxes. We’re sorry. It was not conclusively proven that she was under the influence of illegal substances. But she experienced a dramatic decline from hero to villain and her ‘victories’ are no longer recalled so fondly. After the euphoria of Italia ’90, Ireland had to endure a far more prosaic experience this time around in a tournament with many parallels to our fate in the 2011 Rugby World Cup (for Italy, read Australia). Email “The Magnificent 7: Irish sporting anti-climaxes”. Feedback on “The Magnificent 7: Irish sporting anti-climaxes”.